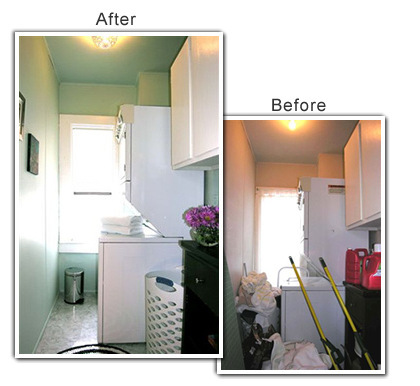 While a main-level laundry room is always a positive feature, the laundry room in this four-bedroom home was too small and the space was being used as a catch-all for excess storage. It lacked organization and had dated 1970s linoleum on the floors and walls that was scuffed and stained. "The room seemed smaller than it actually was because it was so drab and so disorganized; you couldn't even see the floor," said Lori Matzke of Centerstagehome.com. "We wanted to brighten up the space as much as possible, give it some breathing room and turn it back into a positive feature." To create more space, Matzke emptied the wall cabinet, boxed up everything that was not immediately needed and raised the shelf a few notches to accommodate the laundry soap and larger cleaning supplies that had been sitting on the floor. Piles of clothes were laundered and put away. A large bag of dog food, mops and buckets were stored elsewhere. The walls and ceiling were painted a cheerier glass blue with an eggshell finish with paint leftover from a previous project. Trim around the windows and the hanging wall cabinet were painted glossy white to add sheen. After cleaning the old linoleum, Matzke installed adhesive tile squares that she bought for less than $27. Moving the stackable washer/dryer set several inches down the wall and 2 inches back created a small pocket between the wall and the appliances to store the ironing board and a step stool. The warning sticker from the dryer was peeled off and placed on the opposite side of the machine, rust spots were lightly sanded and touched up with white appliance paint and the washer and dryer were thoroughly cleaned. A dusty tab-top curtain that blocked natural light was replaced with a vinyl roller shade for $7. Two rows of black rick-rack trim were attached to the bottom of the shade with a hot glue gun to dress up the vinyl. A stainless steel trash can with a step-down lid and a tall wash basket were left out for easy access. Matzke added a vintage snap-on shade she painted glossy white to match the trim and cupboard to downplay the boring bare bulb. Understated artwork, a small braided rug and a short bouquet of fresh mums make this laundry room more attractive.